Published on May 26, 2017 in Lake Winnipesaukee Hotel. Closed Tags: kayaks, paddle boards. The waters along the beachfront at the Center Harbor Inn are bobbing with excitement. Our recent shipment of brand new watercraft has arrived and guests are sure to be delighted. 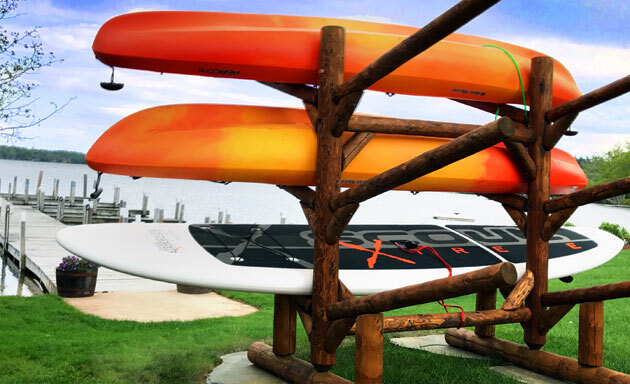 Featuring six Abaco Single Kayaks, two Abaco Double Kayaks, four Jimmy Styks Scout Paddle Boards and two Pelican Pedal Boats, the new fleet offers a variety of options for anyone looking to launch from our sandy beach and explore Lake Winnipesaukee. This exciting new addition sets the Center Harbor Inn experience apart from other lodging options along the Lake. Each reservation includes one free half day rental of a watercraft of the guest’s choosing based upon availability. The new water activities program also offers additional half day rentals for $20 and full day rentals for $35. Enjoy a one-stop shop for your ideal lakeside getaway. Get out on the water with your friends or family and make the most of your trip to scenic Lake Winnipesaukee.